Love buffalo wings but kind of hate the mess and how hard they can be to eat at parties? 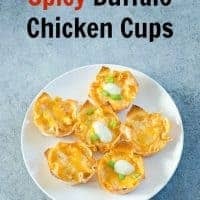 My spicy buffalo chicken cups recipe has all the flavor of your favorite wings and dip in one neat bite. This is a sponsored article and recipe written by Smart Savvy Living on behalf of Naturally Fresh. Ahh, I can’t believe it’s already time to start putting together Super Bowl recipes! I honestly don’t really follow sports much at all, but I do love watching the big game each year. Yes, mostly for the commercials and good food – I know I can’t be the only one! Since I love taking little bites of several dishes, I love love love Super Bowl parties for all the appetizer type dishes generally served. One of the classic favorites is, of course, chicken wings, but they can a bit time consuming to make when you need to make a ton, plus they are messy, have lots of waste and aren’t exactly something you want falling on your couch. So, this year I decided to make things a lot neater, yet still packed with that wing flavor we all love with this Spicy Buffalo Chicken Cups recipe. We’ve really been trying to cut back on eating a lot of pre-made foods because so many are just full of junk. So, I’m always delighted to find ready-made foods that pride themselves in using real and wholesome ingredients like Naturally Fresh® does. For example, I absolutely love that they put REAL chunks of aged bleu cheese and buttermilk in their Bleu cheese dressing. Naturally Fresh® does NOT use: artificial thickeners, MSG, artificial preservatives (which is why their products are refrigerated at the store), or artificial colors or flavors. 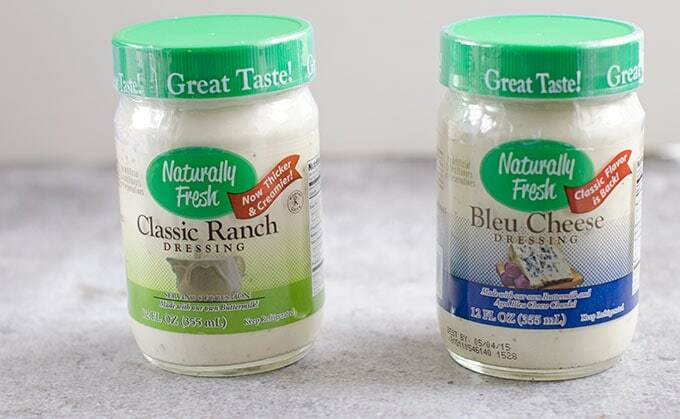 I love that all you can taste in their delicious thick and creamy dressings is just real natural flavor without any aftertastes. Naturally Fresh® products are sold at Kroger and Publix in the refrigerated section. You can download the free Naturally Fresh® mobile app where you can find out where you can buy Naturally Fresh® products locally, information about the newest products, and get new recipe ideas. This Spicy Buffalo Chicken Cups recipe packs all the flavor of tasty buffalo wings without the mess. The wontons add a crispiness, while the buffalo sauce adds deep flavor to the creaminess of all that cheese and dressing. 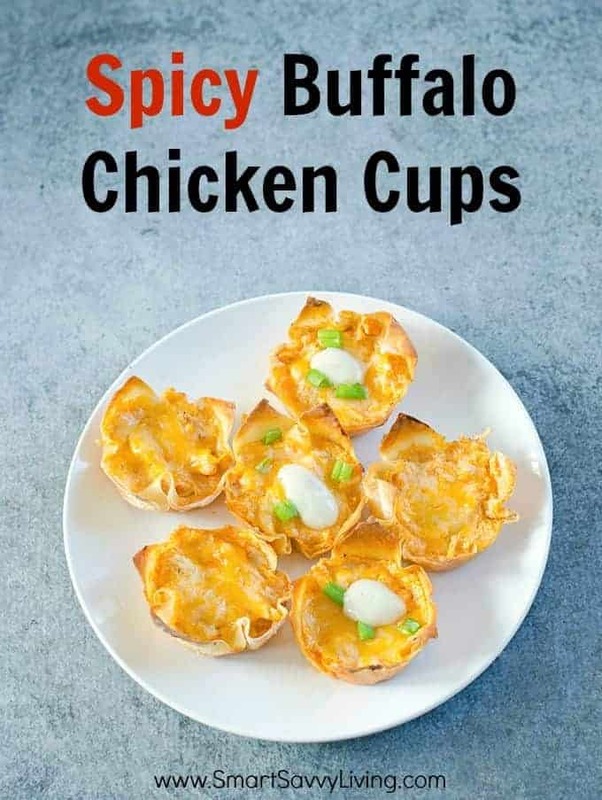 This spicy buffalo chicken cups recipe has all the flavor of delicious chicken wings without the mess and fuss. If your cream cheese isn't overly soft, you can microwave it in a microwave safe bowl for 15 - 30 seconds. In a medium-sized bowl, combine cream cheese, dressing, buffalo wing sauce, 3/4 cup shredded cheese, salt, peppers (if you use spicy wing sauce, you may want to taste for spiciness before adding cayenne) and garlic powder until well combined. Fold in chicken. I like to use rotisserie or leftover chicken to save time and a mix of white and dark meat. Spray regular-sized muffin tins lightly with cooking spray. Place 1 wonton over each muffin tin cup and press down in the middle to form a cup. Place about 1.5 - 2 Tablespoons of chicken mixture into each cup. Don't fill the mixture over the sides of the wontons as you don't want them to cook over. Sprinkle the topping cheese evenly over the cups. 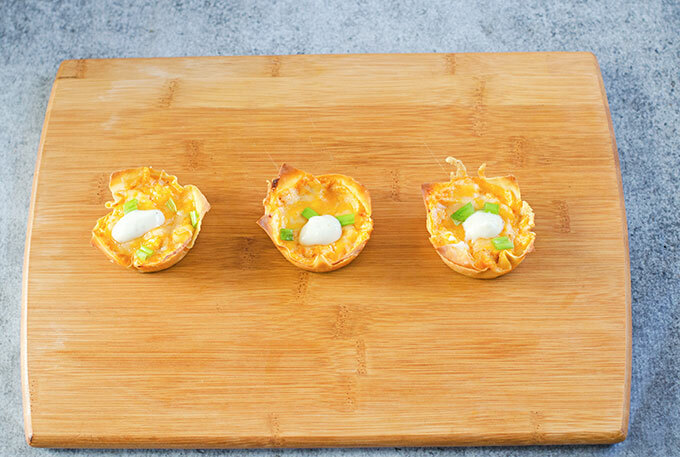 Place the cups into a 375 degree preheated oven and bake for 8 - 10 minutes, or until edges of wonton cups are nicely browned and cheese is melted. If wontons are browned and you need to cook them longer, cover with foil. Once done, remove the tins from the oven and let the cups cool for a minute or 2 in the tin, then use a spoon to remove them from the tins, running a knife along the sides if needed. Top with sliced green onion and/or additional dressing, if desired, and serve. You can prepare the chicken mixture 1 day ahead of time and store in the fridge, but the cold mixture will require longer cooking time. Place foil over the cups when baking to prevent burning if needed. The giveaway has now ended. Thanks to all who entered and congrats to Donna R. for winning. Will you be serving or bringing appetizers like this Spicy Buffalo Chicken Cups recipe to any Super Bowl parties this year? I adore blue cheese dressing on a ham sandwich. I love blue cheese dressing on mashed potatoes. I like to use ranch dressing as a dip. 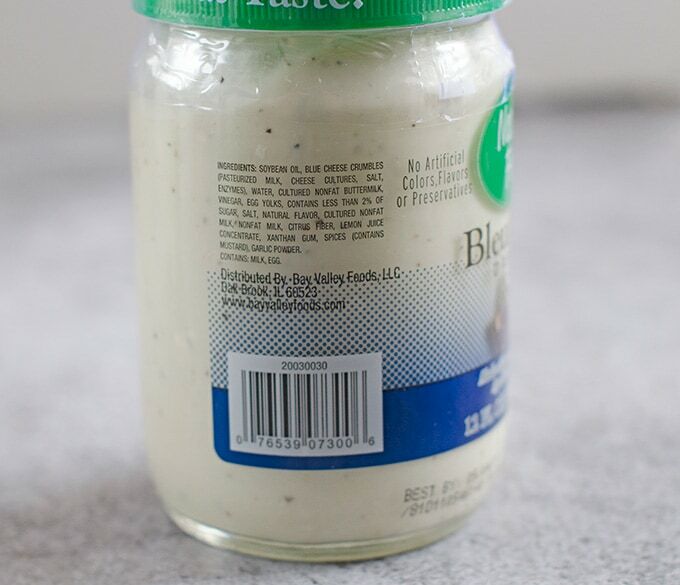 I primarily use it as a dip or spread, but it is also good in macaroni or potato salad. I like using it to dip buffalo wings in!